During a meeting with journalists on Tuesday (20 October), Knut Fleckenstein, the Vice-President of the Socialists and Democrats, said that now was not the time to discuss a European army, arguing that it would provoke Russia. The issue will be raised by the centre-right European People’s Party, as its Statutory Congress starts today (21 October), in Madrid. As euractiv.com reported last week, EPP leaders will adopt a strategic paper to move towards an EU defence union at its annual meeting. Asked if the time was proper to raise such an issue, Fleckenstein was clear. The idea of a European army was recently raised by European Commission President Jean-Claude Junker, with the German government supporting it. The German lawmaker (SPD) said that it was high time that Europe resumed its dialogue with Moscow. The S&D is currently taking an initiative to “revive” the 40-year Helsinki Final Act, claiming that only through dialogue, will Brussels and Moscow be able to find a way out of political deadlock. On 17 November, the group is organizing a high-level conference in Brussels with the participation of Aleksey Pushkov, the Chairman of the Russian State Duma Committee on Foreign Affairs. “Our main goal is, after a large break, to start discussions again with our Russian counterparts,” Fleckenstein said. He also said that MPs should be removed from the EU-Russia sanctions list. Fleckenstein had previously made this request, in EURACTIV, last summer. Asked by EURACTIV if the S&D initiative was supported by his EPP colleagues, Fleckenstein replied that a large group of EPP MEPs agreed with it. “The Italian EPP members have been quite in favour, as well as lots of members from Germany and France,” he noted. But S&D sources told EURACTIV that MEPs from Eastern Europe have expressed serious reservations about this initiative. Referring to the Syria crisis and the recent Russian intervention in the region, Fleckenstein surprisingly said he was convinced that Moscow’s primary goal was to fight ISIS. “I am really convinced that Russia’s first aim is to fight ISIS,” he stated, adding that Moscow is now more “relaxed” and ready to talk to the West, as it had gotten what it wanted. “They wanted to make clear that they play in the first league, not the second. Secondly, they wanted to make clear that, with all the trouble in eastern Ukraine, they won’t see NATO on (their) western borders, and thirdly, Crimea,” he said, adding that every time he tried to raise the Crimea issue with his Russian counterparts, they avoided discussing it. The MEP also added that behind the scenes, Americans and Russians were having negotiations on the issue, and underlined that the recent Iran deal was a good example of cooperation. Referring to Syria’s President, Bashar al-Assad, Fleckenstein said that Russians were ready to discuss the next day in Damascus politics with the West. Fleckenstein reiterated that Moscow got what it wanted, but that Russians were aware of the fact that without Assad, they would not fight ISIS effectively. He added that Russians want a guarantee for their military bases in the country, and then to find a way to build a new Syria, adding “this is not possible with Assad, but for the time being, he is the elected president [for Russia]”. In his state of the union speech last month, European Commission President Jean-Claude Juncker called for the creation of a list of ‘common EU safe countries of origin’, including Turkey. “Turkey is not a safe country”, Fleckenstein said. “It did much to host 2.2 million refugees and someday we will have to compensate it,” he noted, adding that Ankara showed Europe how easily it could “open the door”. You see ! 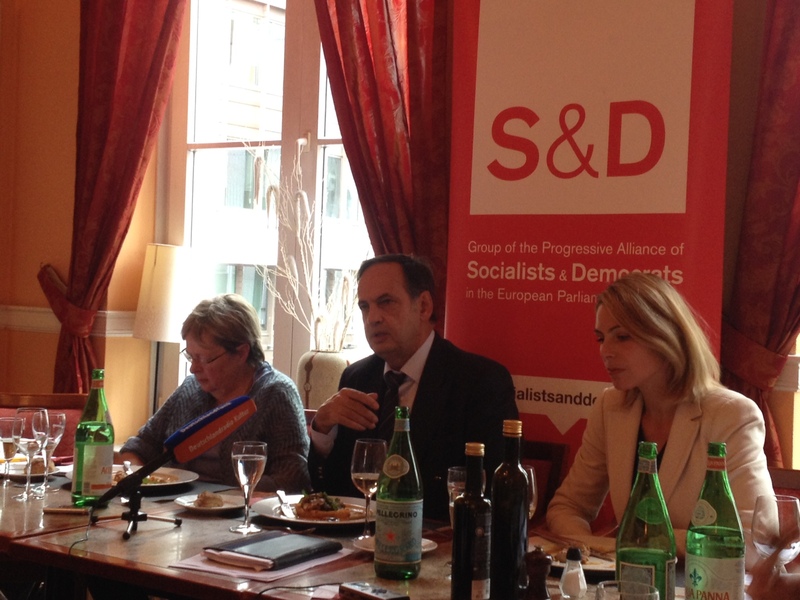 Knut Fleckenstein is acting cowardly and the socialists are looser ! Maybe Knut would like to ask Putin for permission before supporting anything. His main position seems to be to let the Russians have what they want and then they’ll be happy and leave us alone. Perhaps a free supply of nappies would help. And Nut alone can decide ????? Is that true ? ?